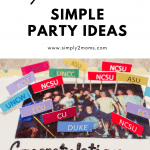 We’re excited to share our simple and inexpensive graduation party ideas. 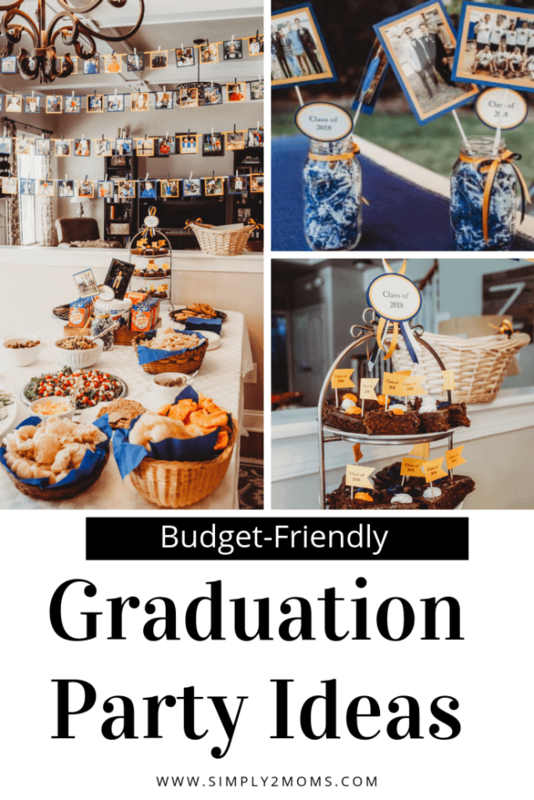 These easy ideas will help you celebrate your favorite graduate in style without breaking the bank. When my son graduated from high school last year, we knew we would be having a party! He’s the oldest grandchild on both sides of our family. With all our families coming to visit, we needed to do something special to celebrate together. I also knew I wanted to keep things simple so we could enjoy this moment. 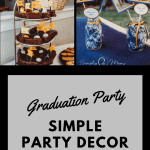 Here are my simple graduation party ideas. I kept the food simple. After all, who wants to spend the days while the family is in town cooking and doing dishes? We ordered pulled pork barbecue and coleslaw from our favorite local spot. Note: when the guy from the restaurant says to order half a pound per person, don’t listen. We had so much left over! Thank goodness it froze well! I enlisted AnnMarie to help and she brought potato salad and cut watermelon plus an appetizer. She’s amazing like that. 😉 Bagged green salad made another easy side. Skip buying big bags of chips that’ll go bad soon after they’re opened. Especially if you live in the south. Jugs of tea and bottles of lemonade look fancy when you put them in cute dispensers. I found paper straws that matched my son’s high school colors at our local party store. My son began playing tee-ball when he was 4-years-old. Travel baseball began at age 12. And he played his last game a few weeks before graduation. I knew I needed to honor this part of his life. In the spirit of keeping things simple, I ordered some favorite dugout snacks from Amazon! Grouping them together on a tray made them look like an old-timey concession stand. There are lots of ways to celebrate your graduate’s accomplishments over their years of school. I opted for a simple set-up to display some of his trophies, awards, and artwork. The favorite item of the party? The list of things he wanted to do when he grew up, recorded when he was 4. Doesn’t everyone want to be a paper-picker-upper astronaut doctor golfer painter? Try adding about 30 more jobs and you’ll get the idea! I put finger foods and desserts on a separate table. Our party began at lunch-time, just after the graduation ceremony. I knew my son’s friends and their families would just be dropping in. Having some light snack options gave people a chance to have a bite to eat even if they didn’t want a full meal. Those are fresh pork rinds in the baskets in the front. The barbecue place makes them and they are SO GOOD! 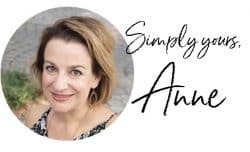 AnnMarie has an Etsy shop called Custom Event Creations. I enlisted her services to make some custom tags that I used in a variety of ways. The little toothpick pennants were a fun touch on the frosted brownies. And I used one of the larger oval tags on top of the tiered tray. I used burlap as an inexpensive table runner option. It dressed up the disposable paper tablecloths on the outside tables. Each table got a simple mason jar centerpiece featuring another one of AnnMarie’s tags, some ribbon and crinkle paper, and some more photos attached to cake pop sticks. I’ve put together a list for you to easily find all the items I used at my son’s graduation party. This post contains some affiliate links for your convenience. 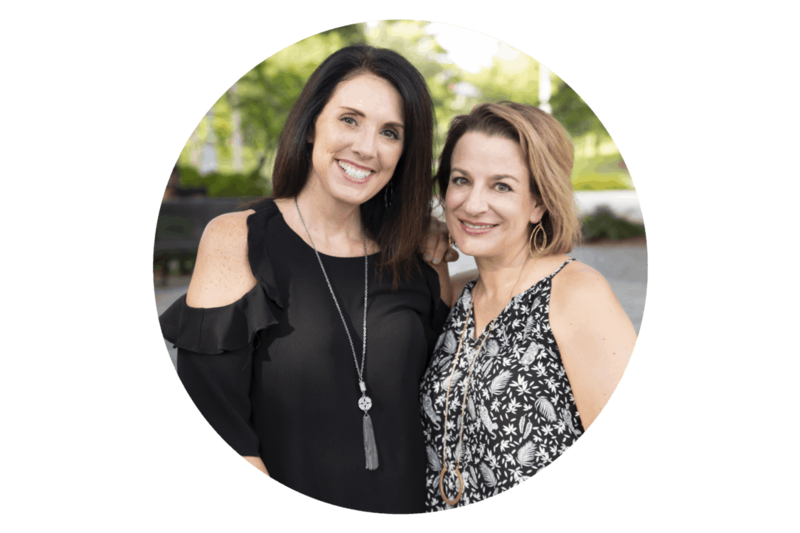 Click here to read our full disclosure policy. Over the course of last May and June, we attended a lot of graduation parties! There were so many wonderful ideas. One of my favorite parties was just after the boys’ Baccalaureate service. All fifteen of his crew were there. We made sure we got them all together for a picture in their gowns. Since they went to two different high schools, we knew we wouldn’t get this special photo on graduation day. She made simple flags with each of the boys’ future destination! I thought that was such a fun extra touch. 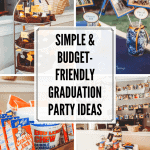 I hope these graduation party ideas help you plan a special celebration for your graduate too! I’d love to hear about how you made your party memorable. Leave me a comment!